Bill Longmuir is hoping for a rethink of the Seniors Tour. Bill Longmuir believes a “thinking-outside-the-box” attitude can help breathe new life into the European Senior Tour, where the Scot has racked up eight wins in the twilight of his career. “When I started out in the senior ranks in 2003, there were 22 events; now there are a lot fewer,” said the 62-year-old, who is coming to the end of a winter post as the director of golf at Royal Westmoreland in Barbados. The 2016 European Senior Tour schedule, in fact, currently consists of 12 events, having been boosted by the recent addition of a new tournament at Hanbury Manor in England and the return after a six-year absence of the Italian Senior Open. The latter is a spin-off from Italy winning the battle to stage the 2022 Ryder Cup, for which Keith Pelley, the chief executive, secured a bumper deal for the European Tour. 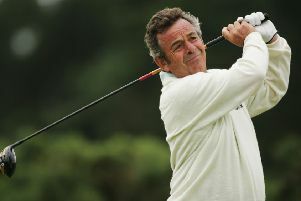 can restructure the European Seniors Tour,” added Longmuir. “It’s a great product for sponsors bearing in mind that the average age of the amateur golfer is 50-plus. The feedback I get from spectators and people I meet at golf clubs is that there is an awful lot of interest out there. “I believe Keith needs to focus on marketing and getting more TV coverage for tournaments. There are options now with live streaming and other TV companies. Unfortunately, the European Senior Tour is tied into a deal with Sky and they only show an hour-long highlights programme very late at night or early in the morning. Despite those circuits increasing playing opportunities for young professionals, Scottish golf is currently having problems when it comes to the top amateurs making the transition to the paid ranks. “I hadn’t quite realised that Scotland wasn’t producing younger golfers,” said Longmuir of the country’s youngest full-time European Tour players being 32-year-olds Richie Ramsay and Scott Jamieson. While still very competitive himself, Longmuir has enjoyed spending the last few months as the “front-of-house face” at Royal Westmoreland, where he recorded one of his Senior Tour triumphs. “I was approached late last summer by Greg Schofield, who offered me a seven-month contract here from the beginning of October to the end of April,” he said. “After considering my options it was an easy decision to make! “I’ve been coming to Barbados for over 30 years for the Robert Sangster Pro Am, which is held every January. Royal Westmoreland has also hosted a tournament on the European Seniors Tour on ten occasions and in 2008 I was fortunate enough to win. “Barbados is somewhere I feel very comfortable: the climate, the people and the general relaxed way of life. “I feel that I bring a vast amount of experience in regards to what people should expect in coming to a high-end golf resort. “I’m very much a people person and it is my passion that everyone should get the most out of their golf. Born to Scottish parents but raised in Essex, Longmuir has always regarded himself as a Scot at heart. He twice led after the opening round of the Open, first at Royal Lytham in 1979 then five years later at St Andrews. The announcement earlier this year that the Senior Open Championship will be played on the Old Course for the first time in 2018 has Longmuir licking his lips in anticipation. “It would mean an awful lot to me to play in that event and I will be doing my absolute best to qualify,” he declared.